An artist's concept of the star HD 3651 as it is orbited by a Saturn-mass planet and the distant brown dwarf. Discovered just 11 years ago, a class of oddball "failed stars" continues to baffle as well as enlighten astronomers. 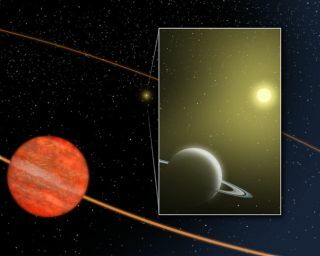 Now researchers have spotted for the first time one of these failed stars, called a brown dwarf, with a companion planet-both orbiting a Sun-like star. "This is the first brown dwarf that has been directly imaged in an extrasolar planetary system," lead researcher Kevin Luhman of Penn State University told SPACE.com. The finding, detailed in the current issue of The Astrophysical Journal, sheds light on these mysterious objects that blur the lines between a planet and a star. Brown dwarfs are too small to trigger the fusion of hydrogen that keeps stars like our Sun shining for billions of years. Instead, with masses up to 75 times that of Jupiter, brown dwarfs slowly cool and fizzle out over tens of millions of years. Located within the constellation Pisces, the newly spotted object is called HD 3651 B. It is 50 times the mass of Jupiter and thus considered a T brown dwarf-the coolest of the two brown-dwarf categories. This slow smoldering releases infrared light, which was detected by NASA's Spitzer Space Telescope [image] . One reason the dwarf stayed out of view until now, Lunham said, is its lengthy distance from its planet partner, which the researchers spotted using the Doppler method. This technique measures the wobbles of a star caused by the gravitational tug of an orbiting object that otherwise can't be detected. Luhman said due to the brown dwarf's prolonged orbit time of more than a thousand years and its miniscule gravitational effect on the star, Doppler was unable to pick up the object. The discovery helps to clear up a quandary. When astronomers discovered the system's Saturn-sized planet in 2003, they didn't know the cause of its elongated, elliptical orbit. Now they suspect the tug from the brown dwarf's gravity could be partly responsible for stretching the planet's orbit. "Other planets with elliptical orbits found around other stars with Doppler observations may also have previously unseen, distant brown dwarf companions that are perturbing their orbits," Luhman said.